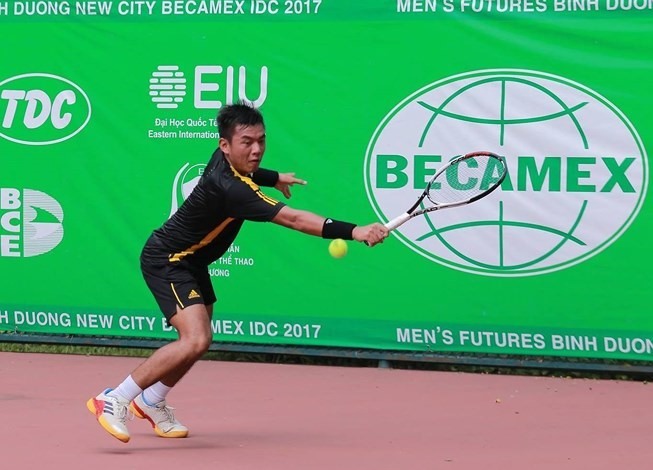 HÀ NỘI — Lý Hoàng Nam scored another win over Australian Blake Ellis in the first round match of the Việt Nam F2 Men’s Futures tennis tournament, held yesterday in Bình Dương Province. Nam, world No. 552, beat No 695 Ellis, who is among the talented young players of his country, 7-5, 3-6, 6-2, in a two-hour match and earned his second round berth in the singles category. At the F1 event last week, Nam won 7-5, 6-7, 6-3 in the quarter-finals. The host athlete, seeded No 6 here, will next Mikalai Haliak from Belarus. Haliak ranks 1,052 in the world. He defeated Vasko Mladenov of Bulgaria 6-4, 6-4 yesterday.